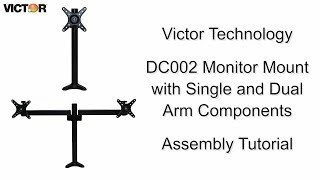 The Victor DC002 Monitor Mount optimizes the space of any traditional or standing desk by freeing up the work surface allowing more room for other items. The 16.5” tall monitor mount is adjustable with a range of 12.5” that allows for correct ergonomic placement of the monitor(s). Not only is having monitors at the correct ergonomic height more comfortable, but it also alleviates strain on the neck and eyes. The DC002 offers components for both single and dual monitor applications. The Monitor Mount attaches to any desk of 1-inch thickness or less by through-hole (grommet) or clamp attachment components. Both attachment components are included. The sturdy aluminum stand supports one monitor of any size up to 15 lbs or two monitors up to 23” wide and up to 15 lbs each. The Tilt and Swivel function creates a broad range of motion for the monitor(s). A single monitor has a tilt range of 45° and a pan range of 225°. When using two monitors, there is a tilt range of 45° and a pan range of 180°. The DC002 can be attached to any work surface by mounting hole or clamp. Compatible with Varidesk, Flexispot, Victor, and many other standing desk converters. Standard VESA mounting holes on monitor are required. 3 Year Limited Warranty. Monitor height has an adjustable range of 12.5"
Desk Thickness (in.) Up to 1"